The Appalachian LCC and Virginia Field Office of the U.S. 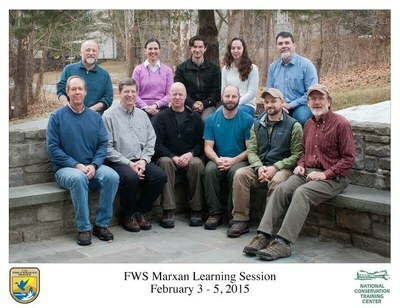 Fish and Wildlife Service jointly hosted a two-day Marxan learning session delivered by the Pacific Marine Analysis and Research Association (PacMARA) at the National Conservation Training Center in Shepherdstown, West Virginia. Attendees came from the U.S. Fish and Wildlife Service, U.S. Geological Survey, U.S. Forest Service, Environmental Protection Agency, and Clemson University. As Marxan is among the most widely used conservation planning tools throughout the world and its outputs serve as decision support for land managers and conservation practitioners alike, the Appalachian LCC is dedicated to building the technical capacity for its use. By providing this valuable training, the Appalachian LCC is facilitating the integration of emerging science and decision support tools at multiple scales. Utilizing Marxan, the Appalachian LCC and its partners will be able to identify the most effective network of conservation areas throughout the region. This facilitates strategic habitat conservation by ensuring resources are used in the most efficient manner possible to conserve landscapes capable of supporting self-sustaining populations of fish and wildlife. Marxan Training Talk 4 - How Does Marxan Find Good Solutions? PowerPpoint presentation for Talk 4 of the Marxan training session. User manual for Zonae Cogito software. The purpose of this software is to act as a decision support system and database management system for the suite of Marxan software. This reference focuses on the functions, design, and limitations of protected areas and the processes of conservation planning. Reference which describes the steps involved in designing a network of marine reserves for conservation and fisheries management.